So you offer plenty of downloadable files on your website? Keeping them all organized is going to be easier with plugins such as Download Attachment. This plugin has a drag & drop interface, allowing you to insert your Media Library files and display them before/after or inside your posts. It also keeps track of download counts. Download Attachments lets you sort and order your files conveniently. It supports custom download slugs. You get 2 shortcodes and additional functions to do more with it. 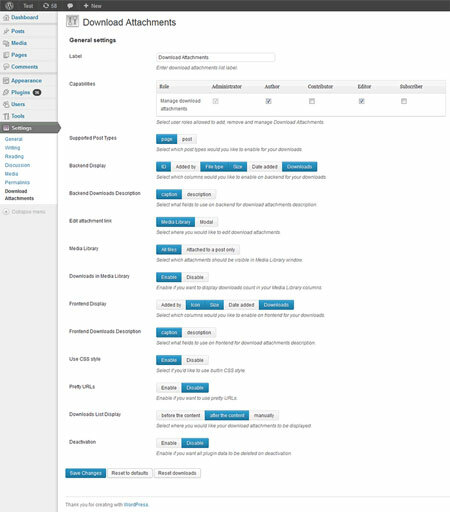 Users can change URL and various display settings from the backend. Roles can also be enabled and disabled. This plugin lets users choose list or table display style for their downloadable items. It is ready to be translated. This is a free plugin.